On April 12, 2008, John's friends and fans gathered at the wonderful Towne Crier Cafe in Pawling, NY for a musical tribute to John. This DVD presents some of the best moments from that concert. The John Stewart Band (Dave Batti, Dave Crossland, Bob Hawkins, John Hoke, Dennis Kenmore, and Chuck McDermott) was joined onstage that night by special guests Buffy Ford Stewart, Rosanne Cash, John Leventhal, Maura and Pete Kennedy, Jim Dawson and Steven Donaghey. All of these musicians flat out ROCK. It's John's music the way John used to play it in the Phoenix Concert days and they raise the roof off of the Towne Crier. 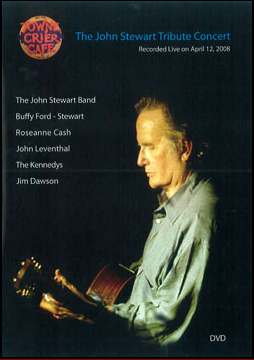 If you are a John Stewart fan, you will love this DVD. It captures all of the emotion and incredible music from that night.